Approximately 18 years ago, I worked in the "Outstanding Florida Waters" program for the Florida Department of Environmental Regulation in Tallahassee Florida. My supervisor at that time was a man by the name of Tom Swihart. I was in graduate school at the time. Tom sort of "took me under his wing," so to speak, and one of the things he did for me as a relative newcomer to Florida from Rochester NY was to provide me with a list of special places in Florida that I someday needed to visit and experience. Guidebooks advise that the ideal water level for paddling this creek is 2 to 4 feet. Much lower requires lots of portaging and much higher puts you into a lot of trees. On the day we visited with our kayaks, it is at 1.5 feet. We are fortunate to be in kayaks. We do not experience the need to constantly portage, but we do need to carry our boats over a few logs. Life would have been very unpleasant for a canoeist that day. The creek is very appropriately named, as I would say the creek is the "blackest" (most tannic) of any of the clear water bodies I've paddled. The tea-colored waters reminded me of the Suwannee, but it was a stronger color-accentuated by the sugar-white sands on the creek banks and creek bottom. 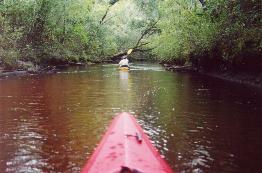 The first one-third to one-half of the 7 miles we paddle is a very nice paddling experience. Very quiet, with no urban noises or traffic noise to mar the experience. The creek is rather narrow, and does a lot of winding through the forest. A relatively swift current makes the paddle in this section quick, somewhat technical, and provides a few minor "whitewater" opportunities. The winding character is interspersed with straight channel sections. Combined with the "spoil banks" I believe we see along the banks, and the probably historic paper company ownership, I'm guessing the straight sections are due to channelized dredging decades ago (to facilitate moving logs?). In any event, had that happened, the present condition is such that the creek now looks rather natural and attractive. While the forest along this section of the creek is quite attractive and "enclosing," we find that there is quite a bit of "scrubby," "shrubby" tree growth along the banks. There is almost no development along the first 60-90 minutes of the paddle, as most all of the land seems to be owned by the Gilman Paper Company. One striking aspect of the character of the river is that despite the absence of buildings or recreational boats along the upper section of the creek, we see almost no wildlife at all. Very, very few fish, wading birds, or even turtles. The remaining one-half to two-thirds of our paddle (approximately 2 to 3 hours) passes through a section that is a strong contrast to the upper portion. The forest opens up and contains a number of boat docks and homes. Occasionally, we see tall, white sand slopes near the creek. The creek widens and deepens quite considerably in this downstream section, and we see a number of large motorboats docked in this area, which confirms the larger creek size.